Everyone knows that smartphones are time-savers, but before this challenge, I didn’t realize just how much time I was saving. I didn’t realize how easyI had it just a week ago. Quarter-hours are saved by having a smartphone do the mundane, yet necessary tasks we face on a daily basis. A quick tap here and there, then boom. Payment made. Here, my phone-reliance revealed itself not in a grandiose fashion, but in the seconds and minutes lost to inconvenience. On my phone, I use facial recognition to login in lieu of manually entering login credentials. It makes life so simple with a “set it and forget it” mentality. I almost spent an infuriating hour retrieving account information as my passwords had invariably escaped me. I’m an app developer. I’m constantly testing out my work and making sure my apps function is a daily requisite. A more layman’s issue I faced was not being able to find the quickest route home since I commute to work. Using a flip-phone also ruins the convenience of ordering food. I can cook, but who isn’t guilty of succumbing to indolence, of capitulating to convenience? Although I’m not a big social media head, I am an avid user of a free investing app. Not being able to potentially profit from my stock picks irked me. Day 1 done. After starting day 2, another few inconveniences materialized. That morning, I needed a contact’s info that became irretrievable due to the two-factor authentication needed to access my email. It was mid-afternoonwhen withdrawal hit. I found myself fidgeting.My mind raced to occupy itself with something, anythingwhile waiting for my coworkers to finish lunch. Two days without my smartphone made me realize how I use it at every opportunity, at every occasion. Later that day, I received a check in the mail and had no time to schlep to the bank. Having a smartphone, I wouldn’t’ve had to bother since I’m able to deposit checks at the snap of a picture. Day 3 of this challenge and I’m feeling stressed and depressed.Not being easily reachable is distressing because I have people who contact me via apps only. The depression stems from being ripped away from my mobile games. My week’s pause has erased a prior week’s worth of effort. In a game that requires hours of playtime and multiple level ups, falling behind is tantamount to dropping out as a contender for victory. I just want the challenge to end already. I’m pressured from family to be constantly connected; I’m asked why I “missed” an event that required a mobile check-in. I was at the said event. Day 4 was horrible without my smartphone. There was a small emergency where I needed GPS to find a route around an accident to get home. As for my second complaint of the day, I had some documents in my (smart)phone that I needed to forestall getting hit with fines. I had to T9SMS my coworker so he could email them from my phone, as my phone was being held from me against my will. Smartphones just make life easier and expedite everyday tasks. Yeah, so having a phone dependency isn’t all that bad. Can I have it back now, I remember musing. I mean, there can be good reasons to needyour phone all the time. Being out of touch with some friends and family, I felt like I was living under a rock. It started to weigh on me. To add insult to injury, I got a parking ticket that very night as I forgot my dumb phone can’t pay for the meter. So upsetting. $45 is a lot of money for being seven minutes late. Day 5. I thought I traveled back in time. Nothing makes sense anymore. Pulling into parking, I decided to turn on the radio while waiting for the garbage truck to clear my path. When I looked down, the time was 10:15 AM. Next thing I knew, the radio cut off. I looked at the screen and the clock read 9:30 AM. It was a very strange anomaly the carmaker needs to fix. Needless to say, I was briefly disoriented. This wouldn’t have happened with my smartphone as the car is a “smart car” that would have been connected to my phone. Having a smartphone in a technologically advanced age can circumvent the causes to so many problems… It’s just… I mean, I just trust my phone. Day 6 & 7 felt like an eternity without my smartphone. The days turned into months (i.e. I binged watched anime as I couldn’t handle the friction of operating as a pre-smartphone human). As the morning sun peeked through the shuttered blinds, it shone upon a sad sight — a shell of a man, smashing his F5 key, waiting for his friends to post or message apropos of weekend plans. As I waited, my hopes were dashed and I decided to stay in. The best part about not having my smartphone in the house was reacclimatizing to my home’s smart devices. For example, I spent an entire half hour looking for the remote since I use an app to control my TV. The weekend bettered with each new person dirtying my welcome mat, unable to ring my doorbell as my door’s motion sensor camera that pings my smartphone was rendered useless. I forgot to mention I bought a glorified paperweight that arrived on Friday. My smartwatch has been sitting on my nightstand as I needed a smartphone to active it. Plus I didn’t even get to enjoy my box openingbecause I couldn’t film myself doing so. The smartwatch’s failure to launch also killed my motivation, (just add it to the list,) as I promised myself I’d go to the gym once I was able to track my heart rate and daily steps. The upside of this detox is a new understanding of my dependence on convenience. Today is about how fast things get done. The standard, not the record, is upheld by the smartphone. I also realized I should have backup plans in case the world goes dark — i.e. in the case of a zombie apocalypse. This challenge caused me to self-reflect upon my actions on a daily basis and showed how reliant I am on my phone. This one-week challenge is especially taxing if you don’t prepare for a change in lifestyle. If any of you readers decide to do this challenge, PRO-TIP:make a list of things you use your smartphone for and figure out alternatives. E.g. printing out directions; knowing your banking info; breathing… etc. This challenge made me confront silence. I didn’t like that. Without my phone, I struck up more conversations, although I was left feeling a bit dumber.I mean, I couldn’t Googlefor Pete’s sake! Honestly, I don’t think there was any upside to this challenge — it just made life harder, more time consuming, and more analogue, really. I saw how chained we are to our smartphones. 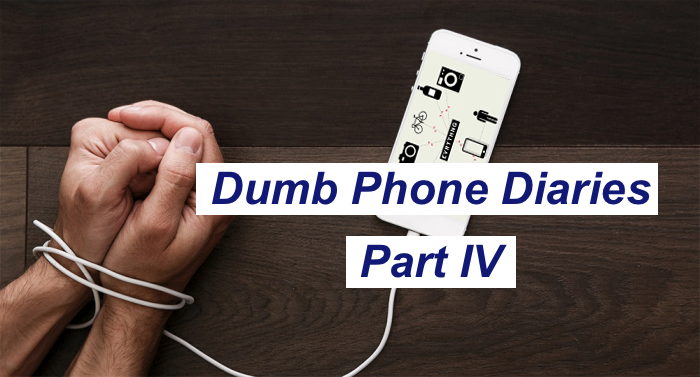 As society grows more and more connected, we end up needing our smartphone for everything. Having a smartphone is a necessity and a required utility that acts as an extension of the self. We needit to exist in modern society. My experience empirically showed how much we use our phones and how entangled it has become in our daily lives.